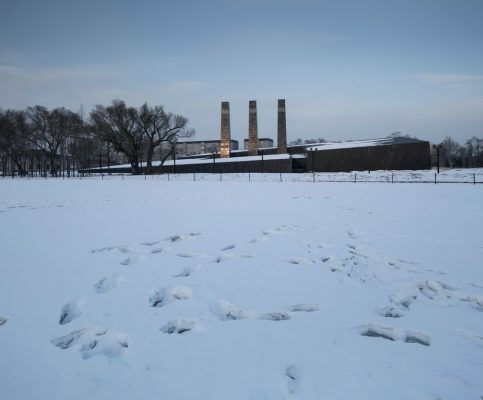 The place where the ruins Unit 731 of the Japanese Imperial Army used to station is particular not just for its role as a historical site. 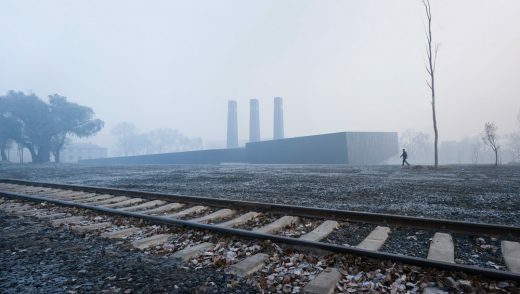 Its particularity is already defined by the broken walls, silent and solemn gravel ground, rails extending to infinity, and the desolate lofty elms surrounding it, before the architect has time to assess the harmony of such combination. 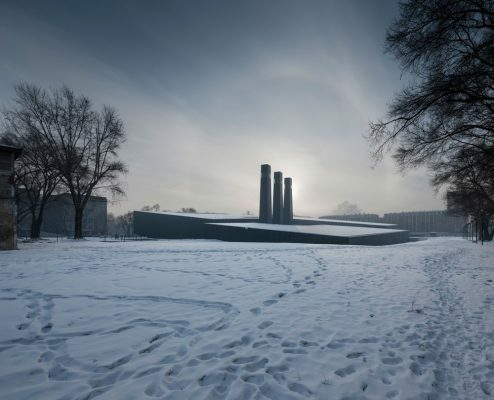 To relieve the repression caused by new building volume upon the site, main display spaces are sunk into the ground. 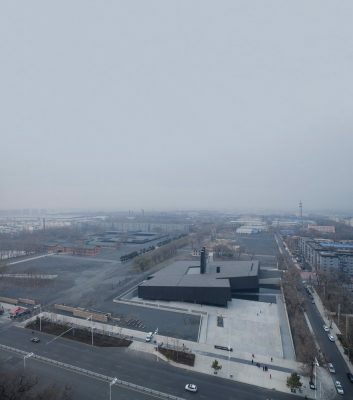 A cracked Black Box tilts on the collapsed site, making its charcoal grey roof an extension of the square ground. The “tilt” shows not only the scale but also the attitude of design. Viewing from the square in front of the office building into the east, the exhibition hall seems like a slight fluctuation in the terrain, more of a natural earth-scape than an artificial geometry. 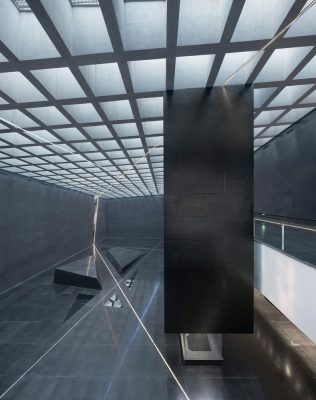 The crack creates subtle variations in form, color and material of the Black Box, which in turn help merge the building into the environment. 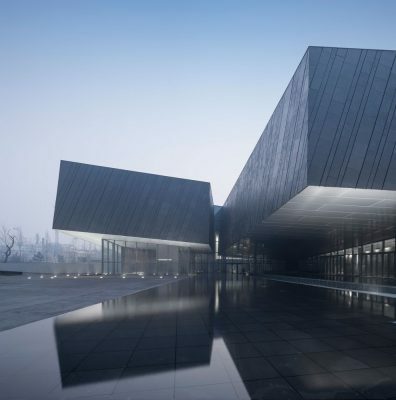 The Black Box is conceived by the architect specifically for the building. It represents a truth-recording container, which will disclose all the truth once being opened. The Black Box collapses, sinks, and falls apart on the site, leaving an eternal “scar” as if the land is incised by a sharp scalpel. 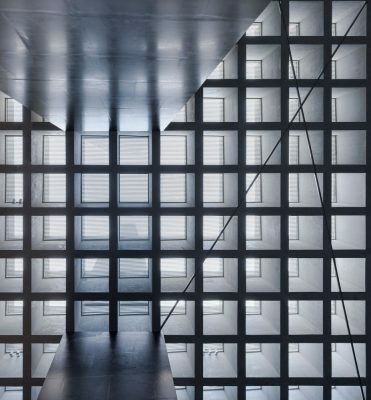 These series of simple acts establish interior-exterior building connection while creating a communicative and dialogic space. 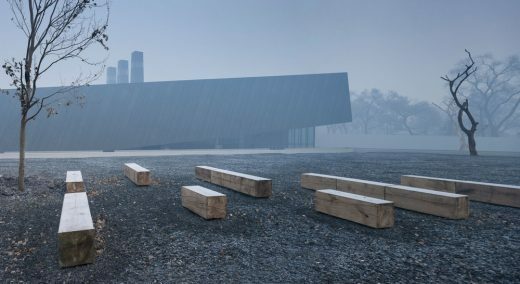 Here the building serves as an objective container for visitors to perceive and interpret the historical event and the implication of the architecture. Unit 731 of the Japanese Imperial Army that invaded China was established in 1933 and they committed war crimes including bacteriologic warfare and human experimentation. Prior to the Japanese surrender in August 1945, Unit 731 bombed and destroyed a large portion of buildings before fleeing, leaving ruins as it is today. 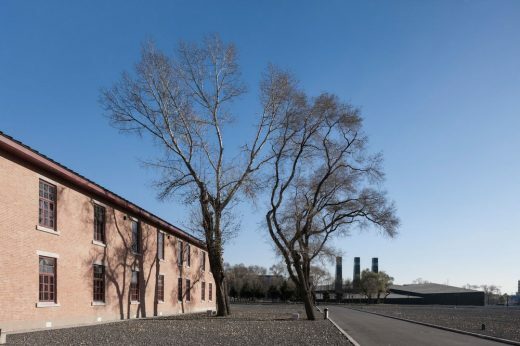 The base for Unit 731 was built near an airport and surrounded by a large expanse of land which now has been turned into bustling downtown. This determines the relationship between the site and its surroundings to be both connected and disconnected. That is an overall design consideration we had. We hoped to recreate the original (empty) environment with the desired atmosphere. We visited the site prior to the design, noticing that the place where the building is currently located is the only location free from the historical ruins. This means building built at this location would not cause any damage; instead, it will establish favorable contraposition with the original entrance and the command. 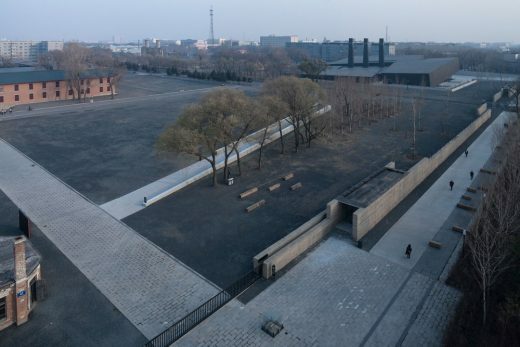 Coincidently, this vacant lot sits by the road, so the exhibition hall can either be visited separately or form a part of the entire visiting sequence together with the ruins. On the west side of the site, a railway that cuts through the site from south to north is still in service. Our first consideration in design was how to establish a closer connection with the ruins beyond the railway, at the same time trying not to damage the original context. In our master plan, first we reinstated the previous road network, then replaced the enclosing wall made of adobes and wire net with concrete and tamped earth. Except for the ruins, we used grey color gravel for pavement to clearly define the relationship between the ruins and its surroundings. Finally, we designed a street park on the east side of the site. 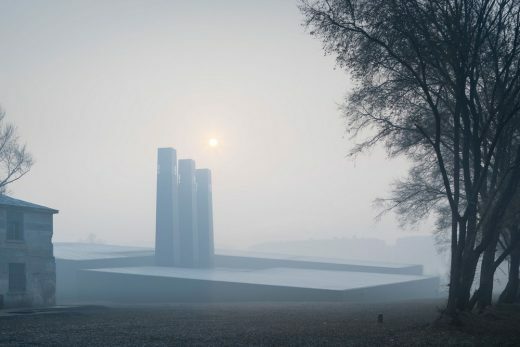 The park serves as a transition between the site and the city, while the enclosing wall along the street is also able to partially filter the noisy outside. According to the regularity, it is inappropriate to build an enclosing wall at the entrance to the site, so we designed a sunken plaza to shield the external disturbance, in the hope of creating a relatively tranquil physical space. After all, we hope the visitors may restrain their mind state a little in such a place. 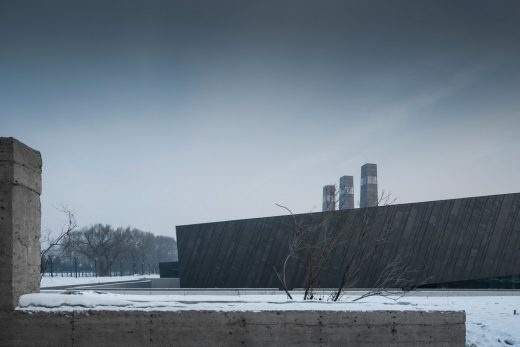 The concept of “Black Box” is basically an unearthing of the crimes committed by Unit 731. The incident was not exposed during the Tokyo Trial, and the atrocities came to people’s knowledge gradually afterwards. The process is like finding the black box and restoring the accident after an air crash. So we hoped to use the concept of “Black Box” as a container from the beginning, and gradually unfold the dusty and hidden story to people and expose the Japanese crimes against humanity. From the design perspective, we employed a refrained approach which involves concise yet power form instead of any exaggerating design. What we tried to express is not an angry mindset, instead, we hope to look at the whole issue from the standpoint of human civilization. Time was our greatest challenge. 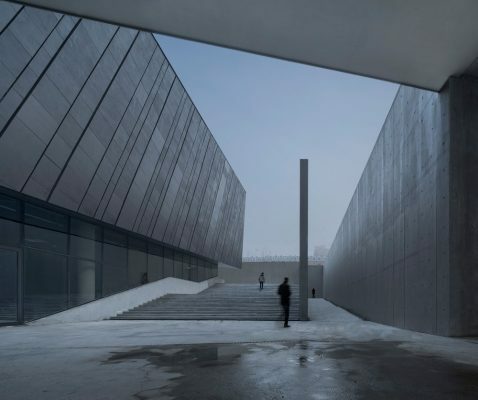 The construction was commenced in September 2014, and the museum was scheduled to open in the coming August (August 15th 2015 marks the 70th anniversary of the victories for Anti-Japanese Aggression and the World Anti-fascism War). However, there were four winter months when construction had to be suspended. Besides, we had to put aside three months for the exhibition setup. During the entire construction process, we exert great efforts on time allocation to ensure every time node was met. So we used steel structures so that we could fabricate and install at the same time. We rushed to complete the basement before November ahead of the schedule. When winter came, the construction team even set up an internally heated shed to ensure the works progress in winter, which was quite usual. Thus, the collaboration on construction method and time nodes for the project was extremely important. At the same time, we had to make up for inadequate design period with our experiences. Thanks to the elaborate interdisciplinary cooperation, the construction was smoothly completed. 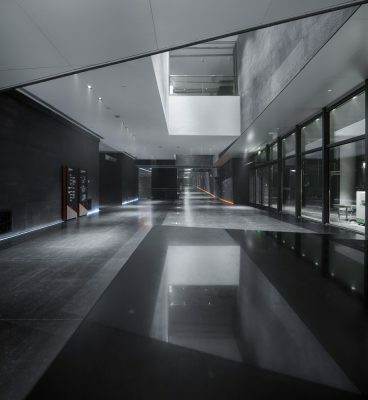 Lighting consultant: GH Architectural Lighting Design Ltd.